I’m about to make one of my huge leaps from the micro to the macro, so bear with me here. I just can’t help but notice a distinct similarity between the punitive parenting style I see in a couple of Progressive fathers I know and Bernie Sander’s hard Left, tax-the-rich politics. Let’s see if I can convince you that there is a connection. As many men know to their cost, women talk to each other. When they have children, they talk about two things: their children and their husband’s parenting style. I am happy to report that, with a very few exceptions, most of my friends have good things to say about both their children and their husband’s style as a co-parent. As I said, though, there are exceptions. Let me give you an example of the punitive parenting style at work versus the mothers’ preferred “natural consequences” style, so you know what I’m talking about. The kid has learned nothing about dressing for the weather and a whole lot about unpleasant power struggles and nasty consequences. The 8-year-old goes out and is very cold. It’s not a happy day for the 8-year-old. The next time that the mother says, “You’d better put on a jacket, because it’s cold outside,” the 8-year-old thinks, “You know, she was right last time,” and puts on a jacket. Everyone’s happy, there’s been no breach of the peace, and the child learns about take responsibility for his physical comfort. To sum it up, Mom lets the child learn from natural consequences. There are no winners or losers; there’s only the acquisition of knowledge. Dad, however, has created a power struggle with winners and losers. And let me remind you that Dad is politically quite Left. Indeed, both the dads of whom I’m thinking are Bernie Sanders supporters. Now that you’ve got those dads’ parenting style in your mind — one that gives the father complete power and that sets up situations in which the dad can enforce punishments — think about Bernie. Bernie is going “punish” rich people. Bernie is going to take away their wealth. Bernie is going to tax capital gains. Bernie is going to decide winners and losers. The fact that Bernie’s “destroy rich people” tax plans cannot enrich the nation is irrelevant. When his spittle flecked mouth opens and the froth flies, America’s rich should just be thankful that we don’t have guillotines on hand. If you’re wondering why I saw that Bernie’s plan can’t work, just watch the video below, which dates back to 2011 and the whole “Occupy” movement. 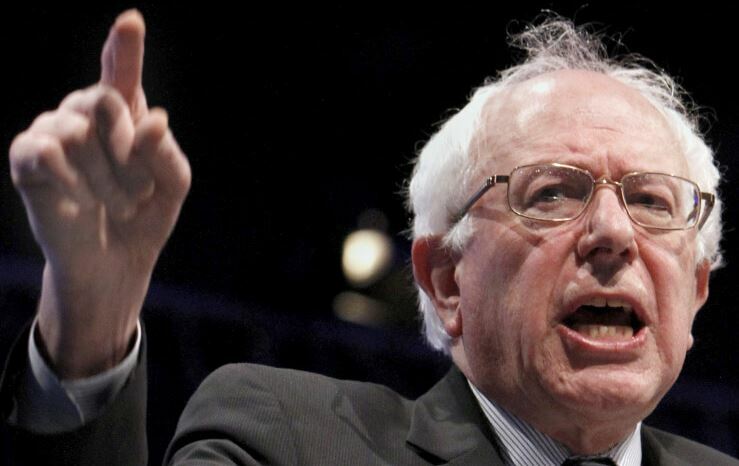 As you watch it, remember that Bernie, with the wild white hair and the got-to-be false teeth is the besuited face of the same rioters who used brute force to punish the haves, while at the same time destroying wealth, leaving nothing for the have-nots. Bernie’s financial attacks on the rich don’t create a benefit. They are purely punitive in nature. They don’t make things better, they make things worse. The only happy person is the one who gets to pull the trigger and not end up dead. As for all the money that the guy with the trigger finger gets to take — and you do realize that, in Bernie’s world, the government is the guy with the gun — do you really think the stolen wealth will be used in a wise way to help the poor and improve the economy? Hell, no! It will be wasted, it will be used to pick winners and losers, and it will be paid out to favored demographics. It will fund corruption, not end corruption. There are lots of ways to improve the financial scene for everyone. Rather than get government’s dirty, sticky fingers in the mix, we want to encourage rich people, not to hoard or hide their money, but to invest it in companies and services and houses and new ideas and all sorts of other things that create jobs, create wealth, and encourage innovation. A dynamic economy, one in which people of means enthusiastically invest, is an economy that raises everyone up, not just those few people and sectors that a corrupt government, rolling in easy money, designates as its favorites. I’m biased in Ted Cruz’s favor, so I like his economic plan, but I’ll say that any economic plan is better than Bernie’s (and better than Hillary’s, since she’s trying to out-Left Bernie). So, are you convinced? Is there something incredibly punitive about Leftists, something that goes beyond their need to micromanage (as both Progressive dads and socialists like to do)? I think both Progressive dads and socialists are invested in power, they turn everything into a power struggle, and they like to punish those they view as wrongly defying their power, without regard for whether their punitive actions improve the overall situation.